Just-cooked salmon bathed in sweet homemade teriyaki sauce. I’m on a bit of a barbecue run here lately. This post is no exception. It’s actually for teriyaki sauce, but I certainly couldn’t just write about making the sauce. I had to use it. Hence the salmon. The sauce recipe is for one that is a little on the “thick” side so it stays put on the grill. That's a functional necessity in my book. I love salmon, and I love teriyaki. Together they are an amazing twosome. There are some tricks to make teriyaki salmon and I will get into them in a moment, in the recipe below. Well, it’s actually not the sauce… Teriyaki is a Japanese cooking technique where foods are broiled or grilled in a sweet soy marinade. Because it is a marinade it is often quite thin. The marinade itself has now become so recognized as "teriyaki" it has taken the name. The actual name for the sauce is “tare." The word “teriyaki” comes from the combination of two Japanese words: teri, the shine given by the marinade, and yaki, the cooking technique itself. Traditionally the meat is either dipped in the sauce or brushed with it as it cooks to get the glistening coat associated with the technique. Many different fish and meats are used in teriyaki. In Japan, mackerel, eel, tuna, salmon and trout are common. In the west you will find chicken, pork and beef on the menu as well. Teriyaki is common in bento boxes (small lunches) where it is served cold. 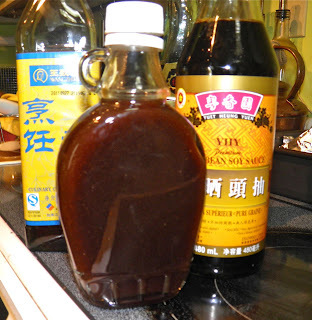 Teriyaki sauce is a fairly simple combination of soy sauce, rice wine, sugar or honey, ginger, and garlic. It is heated and then either boiled down or thickened. Since I wanted a little extra thickness, I resorted to cornstarch. This sauce does have a very high sugar content so if using it under a broiler or on the barbecue be warned that it burns quite easily. As such, cook over reduced heat or a little further away from the broiling element in your oven than you normally would. Think of the possibilities. You could serve a veritable feast of teriyaki for your next backyard gathering. With one sauce you could have fantastic teriyaki chicken, hamburgers and shrimp skewers. Yes, hamburgers. As a side note, Japanese McDonald’s offers a pork Shogun Burger that is a patty brushed with teriyaki sauce. Not to be outdone, Burger King has its own Whopper Teriyaki. The McD’s version is served with lettuce only; Burger King uses tomato as well. I’m starting to want one of those... Sometime this summer I will make it. Speaking of making, make this sauce. You will be glad you did. Mix together all ingredients except for the cornstarch and bring to a boil. 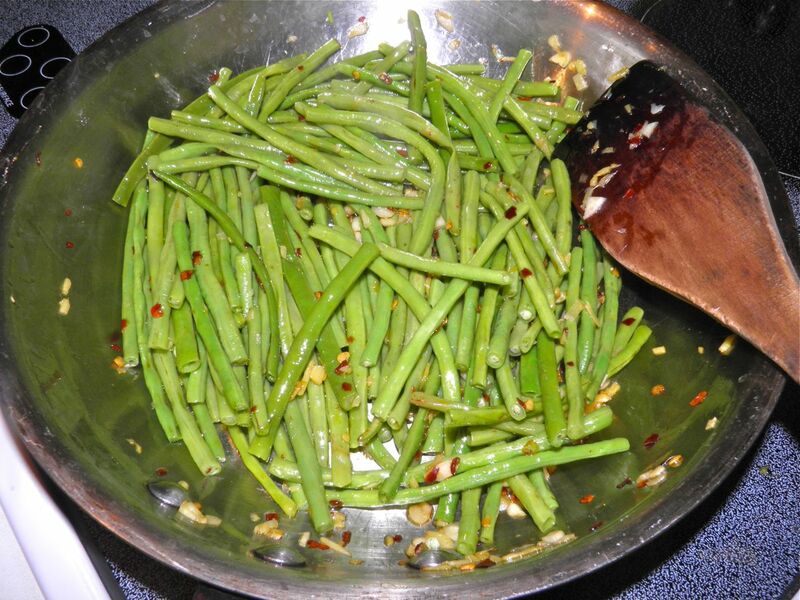 Reduce heat to a simmer and cook for 5 minutes. Mix the cornstarch with the water and add to the sauce. Cook, stirring, until the sauce thickens and becomes glossy. * Naturally brewed soy sauce is what it sounds like: naturally brewed and fermented. It cost very little more (if at all) than other kinds and the taste is so much better than ones manufactured quickly without natural brewing. Line a baking sheet or other oven proof pan with heavy foil. This makes clean-up far easier. 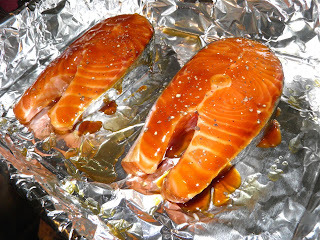 Place the salmon in the pan and sprinkle a little sesame oil around each piece. Baste the salmon portions liberally with the sauce and sprinkle with some pepper. Set the rack about 8” away from the heating element and turn it on high. Broil for 7 minutes. Flip the filets, baste and pepper and broil the second side for a further 7 minutes. The fish will be browned from the sauce but not quite cooked through. Turn off the broiler, turn the heat on in the oven to 350°F and bake for 10 minutes longer. 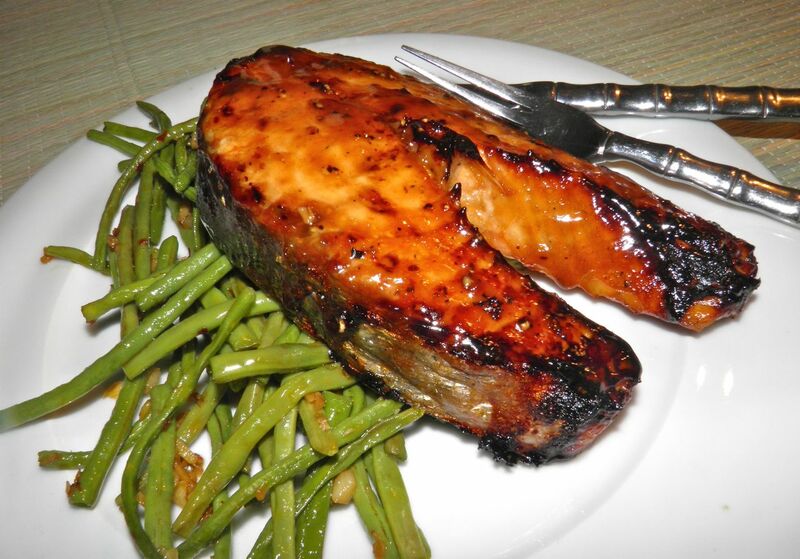 Plate the salmon and baste with more teriyaki just before serving. Trim the beans into 4” long pieces. Blanch in boiling, salted water for 5 minutes. Drain and set aside. Heat the oil in a frying pan. Add the ginger, garlic and chilli flakes. Sauté for about 2 minutes. Add the beans and toss to coat well. Let fry for about 5 minutes, then serve.